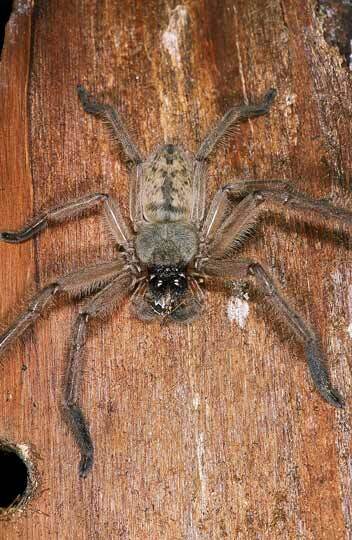 The so-called Avondale spider, Delena cancerides, is an introduced Australian huntsman spider. The first specimens were found in 1924, probably arriving in imported wood used for railway sleepers. Although large and fearsome-looking, it is quite harmless. In South Australia the species is quite common, and some people encourage them to live in their houses to control insects. Delena cancerides is nocturnal, hiding in dark, dry places during the day. Around houses they hide in attics, under corrugated iron, behind pictures and in sheds and garages.